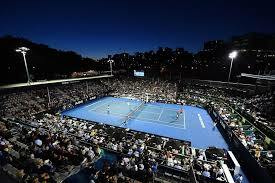 It's an exciting time of year, with the ASB Classic tournaments just around the corner. Televised globally, we will have the chance to rub shoulders with the athletes and enjoy the atmosphere of a world-class sporting event. Tickets for the ASB CLassic 2018 can be purchased from Ticketek. Next Gen will have standing room viewing from the rooftop pool area for all our members to enjoy. Similar to last year, viewing spaces cannot be reserved and any chairs or items left to reserve spaces will be removed to allow fair viewing opportunities for all members. We do ask that clothing is worn, (no swimwear), and that there are no drinks held over or on the edge of the balcony. As of the 13th December, the Next Gen car park will be closed to all. Short term parking of two hours or under will be relocated to the Wilson car park opposite the club. This is for NG members using the facilities during the tournament. Permanent security will be controlling access during club operational times. Please remember to bring your membership card for access. If longer use of the club is wanted, (over two hours), please make use of the parking at Auckland University in the Owen Glenn Building car park. Keep the ticket when entering and pay the reduced parking rate of $6.00 per day at reception to receive a validated ticket. This applies to all membership types. The members' car park will be returned to Next Gen on the 16th January, with Tennis Lane opening fully on 20th January. Please note that Grafton Mews will be closed from the 13th December and Lower Domain drive will also be closed from the 25th December. There will be full access to the gym and all pool areas. Tennis courts will not be available for members or public from Wednesday, 27th December to Sunday, 15th January. There will be a reduction in the size of the changing rooms and access will be via the entrance to the family change area and poolside. This will be in place from the 26th December. The family lounge shall be open and the surrounding areas re-modelled, along with additional tables and seating, as the members' lounge will become the players’ lounge from the 26th December. The Next Gen team and Tennis Auckland volunteers will be available to assist with directions if required.